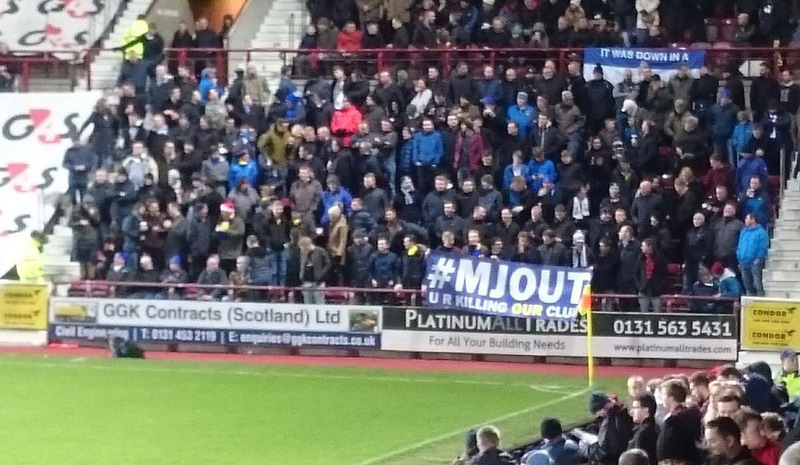 Lee Clark's appointment as manager in February was followed a few weeks later by a stormy club AGM when shareholders made their feelings known about former Chairman Michael Johnston. Nine months later the club has still not appointed a new Chairman to replace immediate past Chairman Jim Mann....and Michael Johnson continues on the Board even though about 3,000 fans signed a petition in good faith seeking his removal. 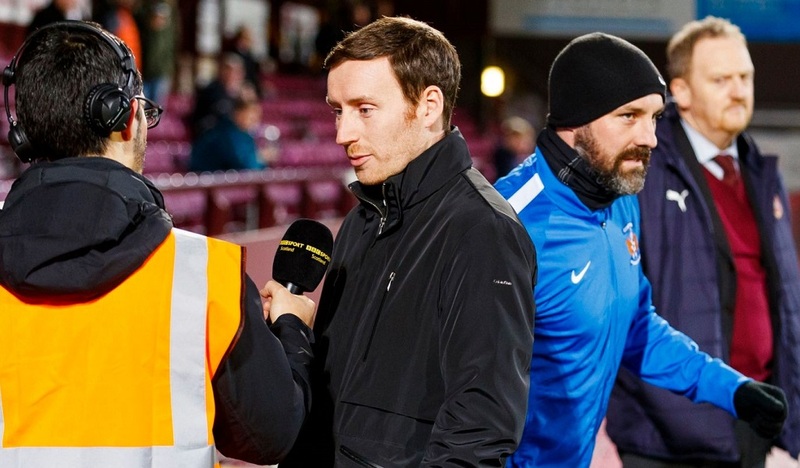 On the park, following a surprisingly good play-off performance the Board and the fans placed their faith in Lee Clark during the summer to re-build the playing staff. Frankly, after more than half a season that faith is looking either mis-guided or simply wrong. Clark started a justifiable clear out immediately after the play off but out of 17 or 18 signings only one or two actually look SPFL standard. We got rid of Mark Connolly due to injury concerns yet he has played almost every game for his new club - it's a pity his replacement Addison has been injury prone. Many fans asked why Mark O'Hara was released and I really doubt which of the many young defenders and midfielders Clark has signed is actually better than O'Hara ? He initially told us he would be signing quality rather than quantity - that now sounds rather like some of Trump's election promises ! Clark has brought a couple of novel ideas - chronological training and an ice box to aid players' recovery. How many of the top teams actually use those training methods ? 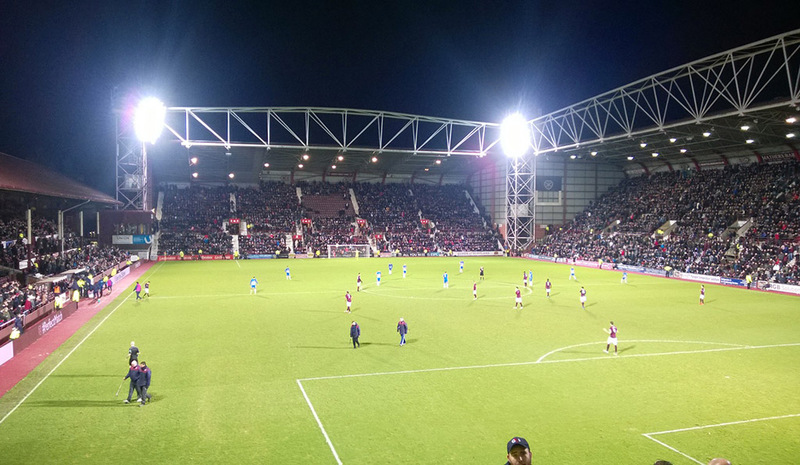 Anyway, over 700 Killie fans paid good money to watch what became an absolutely shambolic display at Tynecastle which seemed bereft of tactics or any system or movement. Killie almost made a dream start when a breakaway run by Tyson set up Boyd whose effort narrowly went on the wrong side of Hearts right hand post. After 8 minutes the home side won their first corner - leading to the third goal in a row which Killie would lose from a set piece. An unmarked and unchallenged Paterson volleyed the ball as it broke to him on the edge of the box burying it in the bottom left of MacDonald's goal. Less than 5 minutes later and Paterson was off the park injured having tried - and failed- to trip and block Tyson as he broke forward. The rest of the first half was quite evenly balanced in possession terms but Hearts looked the more likely to score with blocks from Boyle and a goal line clearance keeping the away side in the game. 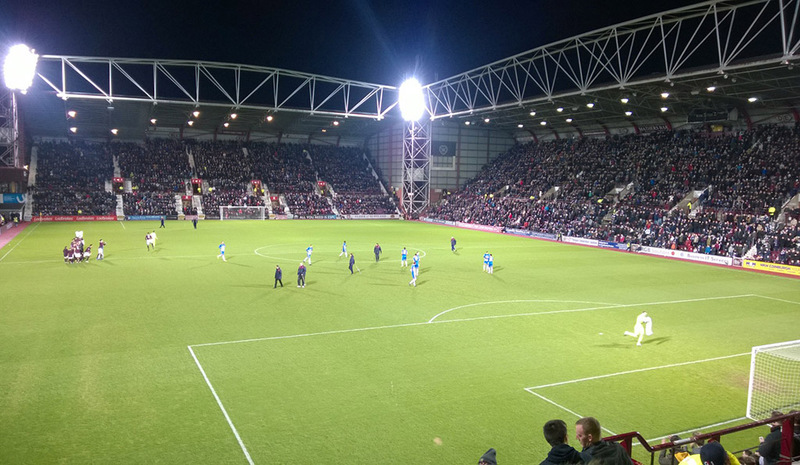 Killie did force Hearts keeper Hamilton into his one save of the evening in the 41 st minute when dived to his left to easily stop an effort from Martin Smith. 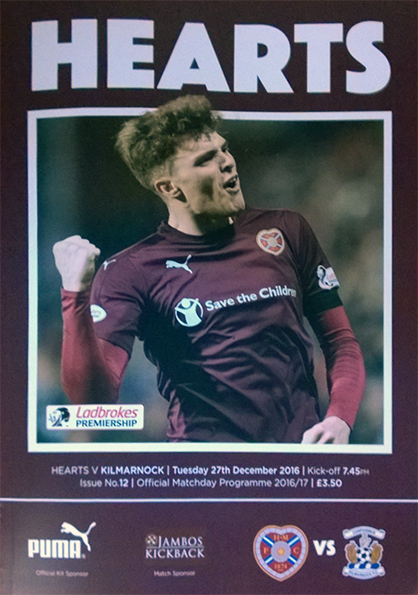 Hearts immediately went up the park and Tyson failed to stop substitute full back Liam Smith putting in a tempting cross which was calmly slotted home by Djoum- 2-0 and Killie fans knowing at half time that the next goal would be critical. It was only three minutes into the second half when the third goal came along - but it was for the home side and, yet again, resulted from Killie's inability to pick up or block "the second ball" from a set piece. A corner broke to Prince Bauben who was allowed space and time to fire a powerful shot to Jamie Mac's right- the keeper did well to make the save but the ball rebounded to Walker to slot home. 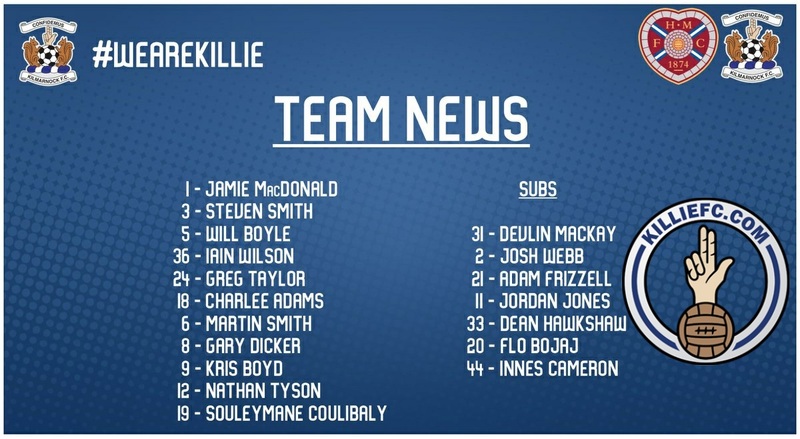 Did Killie change tactics ? Eh....we had switched Coulibaly and Tyson. We did change personnel in the 57th minute with the ineffective Boyd replaced by Jones with Tyson switched to through the middle. It seems that Coulibaly is now stuck wide for 90 minutes of every game - why not play him in the middle for at least some of the game? Hawkshaw also replaced Martin Smith and Killie at least threatened with sub Jones getting to the bye line and cutting the ball back with some menace. 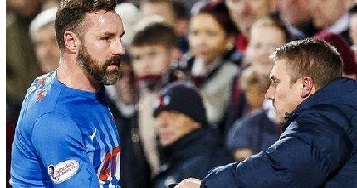 A miserable evening for all associated with the away side was completed when Will Boyle (who was fortunate not to be red carded) was woefully short with a pass back in 70 minutes allowing the predatory Walker to pounce for his 2nd goal and the home side's fourth. 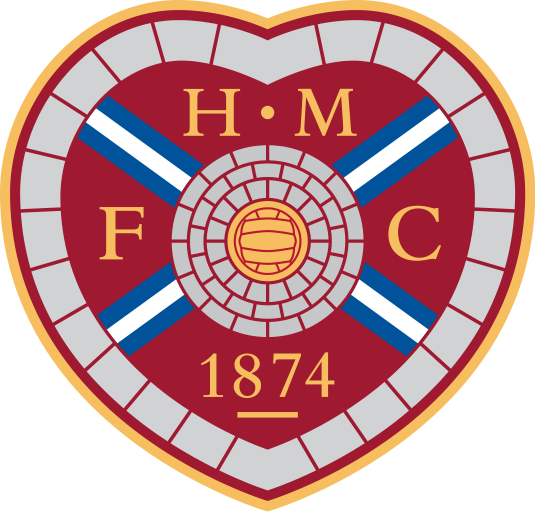 In the dying seconds stand-in centre back Dicker was adjudged to have fouled Zanatta in the box but MacDonald showed once again that he is brilliant at saving penalties at Tynecastle. Will the Board trust him to make more signings in the January transfer window? Will the Club Board actually acknowledge the KFCSA petition and perhaps issue a statement or update on matters? Lots of questions - it will be interesting what the answers are !! Lee Clark: "It just highlights that I've got to change things in the January window to make us stronger, We need to work really hard on Thursday and Friday on nailing down what we're going to do, I have to find a solution either with the formation or personnel. It's a huge game for us on the 31st of December. We need as many points from the teams around us because we're getting heavy defeats from the top six. It's one before a significant break and we have to be right up for it. We're in a rut, we've been struggling the last two games and we've shown that the injuries have taken their toll. We'll need to do something significantly different on Hogmanay against Partick Thistle to make sure we get a positive result because [in] the last two performances we've capitulated and that's been tough to take. We're down to the bare bones and we need these important players back as soon as possible, but I don't think that's going to happen before the weekend."